Architecture Week 2008 – Is It Sustainable? Architecture Week was first established one year ago as part of the celebration of the 150th anniversary of the American Institute of Architects. 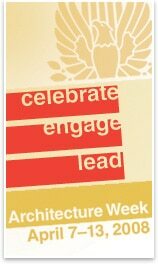 This year, for the second Architecture Week, there are three big programs the organization is promoting. But sustainability gets only a passing mention in one of them, and seems not to be part of the focus anywhere in the program. While the AIA has another program it also began last year titled “Walk the Walk” that offers a good number of resources on sustainability both for architectural clients and the general public, as well as for architects and other building professionals, the topic is not highlighted in the Architecture Week program in any significant way. Architecture Week provides a chance for the architectural profession to draw some attention to the issues of buildings and energy use. And while sustainability is only one of a number of issues that architects must address in meeting their clients’ needs, the opportunity seems to have been missed for a stronger message and more outreach to educate clients and building owners (from individual homeowners to corporate office managers) about the importance of buildings in the perspective of energy use and energy savings. While increasing the efficiency of every vehicle on the road today by 10% would require a huge technological development, it would only save a bit less than 3% of our present national consumption of energy. Transportation represents slightly more than 25% of the national energy consumption, while buildings represent nearly half of all energy used in this country. So while research into improving vehicle efficiency is an important step to be taken, improving the efficiency of buildings will have a significantly larger overall impact. Moreover, many of the developments needed to improve the efficiency of buildings are known and existing technologies, rather than requiring new technological developments. By taking better advantage of daylighting, passive heating and cooling and other design techniques, we can build better buildings that will not leave a legacy of wasteful energy use. And, new and improved technologies will help further improve building performance to be able to reach a goal of carbon-neutral buildings as a standard by 2030. Better buildings need to be part of the steps we take today in order to move toward creating a sustainable future. Architects should use the opportunity of being in the public spotlight to encourage greater public awareness of these issues.